Happy Doll (幸福娃娃) is a Chinese supplier of fabric love dolls. The dolls have a posable skeleton and can stand on their own feet. HA-140 aka Candace: 140 cm, ~9kg, three different breast sizes (C cup/72cm; D cup/73cm; E cup/74cm). HA-160/F aka Aimee: 160 cm, ~8 kg, four different breast sizes (small, medium, large and extra large). HA-160/S aka Nori: same size like Aimee, ~10 kg, one breast size, but breasts with soft silicone gel implants. 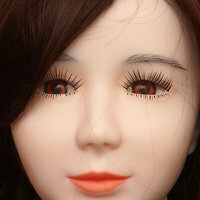 HA-160/R aka Miyu: same like Nori, but with realistic silicone head. HA-165 aka Dagmar: 165 cm, ~14 kg, breasts with soft silicone gel implants, three different breast sizes (C cup/85cm; D cup/86cm; E cup/87cm); optionally available with realistic silicone head. if you need a short doll for easy storage, go for Candace. Different breast sizes are available for Candace and Aimee. But the breasts are filled with fabric. The silicone gel feels nicer. Different sized silicone gel breasts are only available for Dagmar. If you don't mind the fabric breasts, Aimee is a good choice if you are > 175 cm (the doll would be about a head shorter than you). Candace is a good choice if you are 160-170 cm. Dagmar is a good choice if you are >180 cm. The HA-165 aka ›Dagmar‹ is a Anime/Manga doll by Happy Doll. The life-sized doll is made of fabric and features silicone breasts. Although her life-like size of 165 cm, she weights only 14 kg - making her one of the most lightweight dolls on the market! Body measurements: 85/86/87 cm (breasts) × 64 cm (under bust) × 64 cm (waist) × 98 cm (hips) / shoulder: 37 cm / arms: 70 cm / hands: 19 cm / legs: 86 cm / thigh circumference: 51 cm / calf circumference: 31 cm. Dagmar features a poseable skeleton; the eyes can be either open or closed ("sleeping beauty" style). The breasts are available in C, D, and E cup sizes. Miyu aka Realistic Anime Doll is a life-sized love doll made of fabric. Although her life-like size of 160 cm, she weights only 12 kg, that's exactly the same as her Anime/Manga sister Nori! Body measurements: 83 cm (breast) × 60 cm (waist) × 91 cm (hips). This love doll features a poseable skeleton; optionally available is a silicone head. 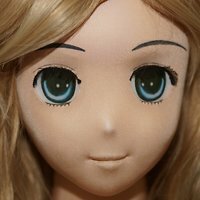 The HA-160/F aka ›Aimee‹ is a Anime/Manga doll made of fabric. Although her life-like size of 160 cm, she weights only 10 kg. Body measurements: 73 cm (breast) × 52 cm (waist) × 75 cm (hips); the body measurements are subject to change according to different configuration options. The HA-160/S aka ›Nori‹ is an Anime/Manga doll by Happy Doll. The love doll is made of fabric with silicone breasts. Although her life-like size of 160 cm, she weights only 12 kg - that's just 2 kilo heavier than her sister Aimee! The HA-140 aka Candace is a medium-sized plush/fabric anime/manga love doll by Chinese manufacturer Happy Doll. Body measurements: Height: 140cm / Weight: 9kg / Breasts: C cup:72cm / D cup:73cm / E cup: 74cm / Under breast: 58cm / Waist: 54cm / Hips: 84cm / Shoulder:33cm / Arms: 40cm / Hands: 14cm / Legs:72cm / Thigh circumference: 46cm / Calf circumference: 24cm. This doll features a poseable skeleton and silicone breast implants in C/D/E cup size. Miyu is a female head by Happy Doll. The head is made of silicone. Nori is a female head by Happy Doll. The head is made of fabric. A1 is a female head by Happy Doll. A2 is a female head by Happy Doll.